Here’s the highlight reel from recent attempts to make Robin better over the past few weeks. Starting later this week, you’ll be able to sign in with an Office 365 account without any extra configuration. This means easier onboarding for your co-workers, and it’s available on all plans. Enterprise accounts can (of course) continue to use SAML via ADFS instead. Room display dimming hours are now fully customizable using the new energy management tool. Take control and keep the screen bright when you need it, dimmed when you don’t. You can find this setting under the Manage > Room Display section for any space. 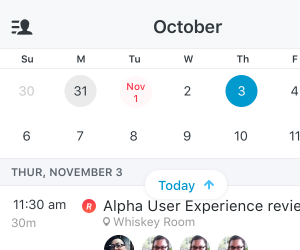 Spaces with room displays will now show their scheduling rules to everyone in the organization, not just admins. Your schedule is the most important part of the day, so we made it easier to jump around events by day. Use the drop down to select any day (past or future) and instantly see the results. If there’s a specific action you need to do (i.e. Confirm) we’ll recommend it within the event itself. 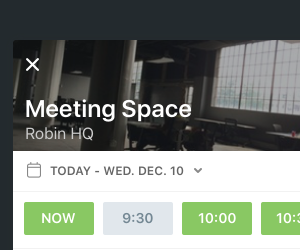 We also trained Robin to recognize even more types of meetings. You’ll now see even more expanded options for services like Skype, Google Hangouts, and WebEx within schedules. Have something else we should learn about? Let us know. The first wave of closed beta release invites went out this month for the upcoming v3 mobile app. It’s one of the most ambitious updates we’ve done yet, and greatly improves the day-to-day experience for people that attend more meetings than they book. 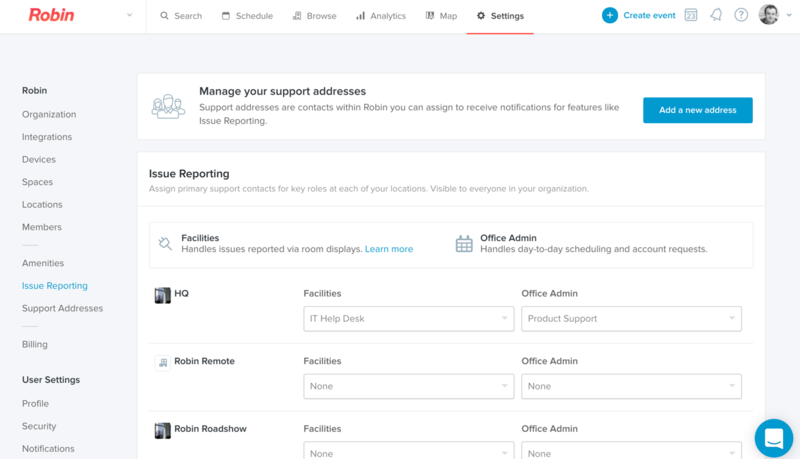 We’ve made getting in touch with your administrators easier as well as improving visibility between Robin administrators trying to coordinate billing and account management. You can also assign more roles for handling common requests around the office. Need to contact someone in charge of the calendars around the office? You can now assign an Office Admin contact to each location. 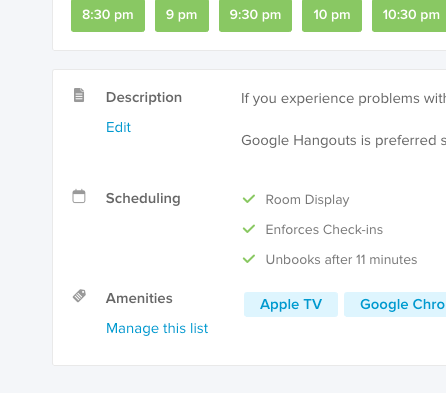 Once set, spaces within that location will show extra options to ask for help or request access to restricted rooms. You’ll see a few more specialized roles (e.g. IT) appear throughout the apps soon. Issue reporting and role assignments are available for Pro plans and above, via Settings > Issue Reporting on the web dashboard. Dedicated login pages will allow organizations to control how their users sign in, and prevent mistakes from using the wrong account. Recurring meetings are almost ready for prime time. This means full edit/delete/conflict checks… without the caveats of today’s beta release. Auto-complete on meeting attendees should include more folks from your recent meetings, etc. Most people don’t memorize email addresses too well… ourselves included. While video dial-in links are a good start, there’s a lot more information we can pull out from meeting invites (e.g. Shared docs). Your schedule should be an easy reference to everything you needed that week. Some spaces have special restrictions, like the maximum amount of time you can book it continuously. How do admins figure out which limits work best, and which just feel “right”? What would you do differently if a room could tell you what its typical event looked like? If you haven’t already discovered it, you should check out our newly released public roadmap, where we give visibility to a small sampling of the updates we’re working on.